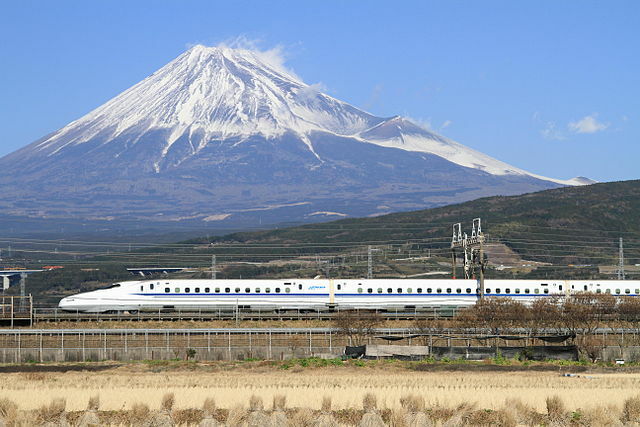 Anyone who has taken the Bullet Train from Osaka to Tokyo – and particularly an Indian, accustomed to unpunctual, overcrowded trains and unruly passengers – cannot but marvel at the efficiency of what journalist Pallavi Aiyar aptly refers to as “the platypus-snouted blue and white Shinkansen streaking past a snow-topped Mount Fuji [which] has become as synonymous with Japan as sushi”. On the platform from which you board, everyone queues diligently against the line on the floor with numbers demarcating your compartment. When the train arrives, it stops exactly at your compartment entrance; everyone boards without pushing and shoving to take a designated seat. 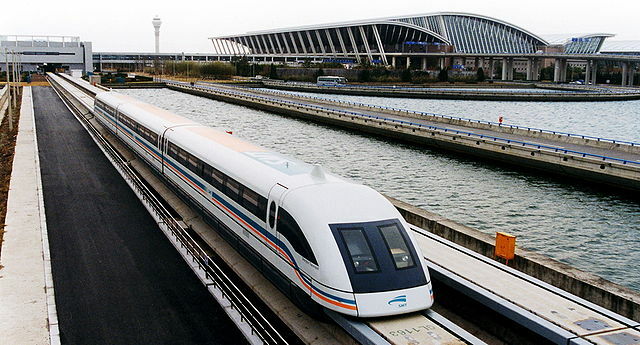 When it takes off, you are hardly aware of the speed because the train ride is so smooth; it travels in a straight line, without any bends or curves. Today, it takes only 2.5 hours to cover the 550-km distance. One can’t imagine anything as remote from Indian Railways as this train, a marvel of Japanese technology. One should preface any assessment of the Bullet Train in this country with the disclosure that it was first thought of by the Congress-dominated UPA government. Like other grandiose projects, such as the under-construction 1,500-km-long $100-billion Delhi-Mumbai Industrial (Freight) Corridor (DMIC), the Rs 3,600-(and mounting) crore Shivaji statue off Marine Drive in Mumbai and the Rs 15,000-crore Coast Road in the same city, these “misconceived” initiatives were the brainchildren of previous Congress regimes. The accident on a local railway station in Mumbai which claimed 23 lives on September 29, and the near-monthly derailments throughout the country that preceded it, have sparked caustic criticism of the Prime Minister’s pet project, the Rs 1.10-lakh-crore or $17-billion Bullet Train between Mumbai and Ahmedabad. Not coincidentally, this connects Modi’s political urban base with the financial powerhouse of the country in Mumbai. Even chauvinistic parties like the rival Thackerays’ Shiv Sena and Maharashtra Navnirman Sena (MNS) have jumped into the fray, alleging that Modi wants to boost his Gujarat International Finance-Tec (GIFT) city being built between Ahmedabad and the state capital Gandhinagar. This supposed first “smart city” will incubate financial services, international convention centres and the like and, Mumbai’s sons-of-the-soil politicos allege, divert resources from the country’s financial capital. Even more specifically, is aimed to benefit super-duper rich Gujarati diamond traders. Raj Thackeray of the MNS, happy to have a grievance that’s fallen into his lap, has vowed not to allow the train to come. Both Senas, needless to say, display no such concern about the profligate expenditure on the statue and Coast Road, which are being rammed through without any public consultation whatsoever. Proponents of the Bullet, which will reduce the journey from eight to three hours and seat 750 persons, point out that it comes with a Rs 88,000-crore loan from the Japan International Cooperation Agency (JICA) at an interest rate of 0.1% with a moratorium of 15 years and repayment period of 50 years. This sounds too good to be true and “an offer that no one can refuse”. India will cough up Rs 20,000 crores, a risible sum since it costs the same as the single underground Metro now being built in Mumbai. However, as with any JICA loan, there are strings attached: there’s no such thing as a free train. At least 30 per cent of the project’s contracts by value has to be sourced from Japanese firms – what used to be called, in the bad old days, “tied aid”. Critics have been pointing out that with inflation and adverse currency exchange rates over half a century, the repayment of the loan will amount to a minimum of Rs 1,50,000 crores. The technology is being touted by the present top government’s economic advisers as one which is advisedly “disruptive” and for the good, like what the “cell phone nation” has adopted. But this begs the question: what if it turns out to be horribly expensive and a white elephant, with no takers for other such high-speed rail projects in the country? In Europe, which is densely populated, such services are making losses. South Korea’s speedster between Seoul and Busan, catering to 70 per cent of that affluent country’s population, is struggling to stay viable. Taiwan’s $14 billion route between Taipei and Tainan almost became bankrupt with losses of $1 billion. Only the Osaka-Tokyo route makes a profit, but a single ticket costs $130. This passes through Japan’s biggest industrial and commercial centres and caters to nearly half the country’s population. By contrast, the area between Ahmedabad and Mumbai is largely undeveloped, even traversing adivasi tracts. As a study by none other than IIM-Ahmedabad -- which ought to know since it’s in their own backyard -- shows, it will require at least 1 lakh passengers or 100 trips a day at fares between Rs 4,000 and Rs 5,000 to break even. There are already 15,000 passengers a day with several trains on this busy route, paying a fraction of that. However, air fares, except at certain periods, are approximately only half as much, so who will take this train? Furthermore, it is essential to underline that while all India’s railways are subsidised, and the Bullet far more so, the airlines aren’t and are still making a profit. Other expensive infrastructure like the Metros, which are being constructed at a breakneck speed in city after city in the country with no thought as to their economic viability, are subsidised, as are environmentally destructive projects like the Bandra-Worli Sea Link in Mumbai. To recover the cost of the train, it will require 550 million trips at Rs 2,000 a ticket. If one estimates that half the current passengers on this route – 7,500 a day – switch to the Bullet, it will take 70,000 days or 200 years to recoup what we have spent on it, not to mention running costs. Should the affluent, who alone can afford Bullet fares, be subsidised? Vivek Sahai, former Railway Board Chair, points out that by later opting for a raised viaduct for the Bullet, the cost will rise from Rs 140 crores per km in 2014-15 to Rs 250 crores, judging by what Metros cost in the country, and only at 100kmph. Permitting 320 kmph on a viaduct alignment will cost Rs 40,000 crores more than the current project estimate. And, he says, nowhere in the world does a high-speed railway cover costs unless 50 million passengers use it every year or 1,40,000 a day. One should heed what E. Sreedharan, the “Metro Man”, says about the PM’s latest fantasy: “This is not the time for the Bullet Train,” he says, “but to improve facilities on the railways.” S.S. Khurana, also former chair of the Railway Board, notes that the government had announced a Rs 8.5-lakh-crore plan to upgrade the railways, which has remained on paper. One has only to recall that former Rail Minister Suresh Prabhu had sanctioned funds for the improvement of the Elphinstone Road foot overbridge which witnessed the September 29 accident in 2015, but the mandarins of the Western Railway had slept over it. Since as many as nine people die every day on the local Western and Central Railways in Mumbai every day, surely this deserves greater priority, not to mention the even more fatal serial derailments, particularly in the neglected eastern sector of the country. In the last decade, there have been 458 deaths due to derailments on the nation’s tracks which are self-evidently over-used. The Comptroller and Auditor General (CAG) noted that between 2010 and 2014, of 33,445 deaths on suburban rail lines in Mumbai, Kolkata, Chennai and Secunderabad, Mumbai alone accounted for 17,638, or 53 per cent. As many as 19,868 suburban passengers died while ‘trespassing’ (crossing tracks) during the five years. In that period, 4,002 Mumbai passengers died “due to falling from trains”. In some high-density corridors, such as in Uttar Pradesh, there are sometimes only 5 minutes between trains crossing, which allows no time whatsoever to maintain and repair them. It requires a minimum of two hours between trains for such upkeep to prevent accidents, as Bibek Debroy from the Niti Aayog told a student audience on NDTV recently. The only solution under present circumstances is to lower the speeds, which only adds to delays and disrupts schedules. India has the fourth longest rail track in the world, some 40,000 miles, of which 33,000 miles were laid by the British; only 7,000 miles have been added since independence. It carried 8.22 billion people in 2016-17 –more than the total population of the world (7.5 billion). The CAG in July 2016 criticised the lack of safety in the Mumbai suburban rail. It found that while suburban services comprised 73 percent of total passengers carried by seven zonal railways, their revenue constituted only 14 per cent of the total. It recommended ‘rationalisation’ (i.e. raising) suburban fares, and even setting up a separate entity to manage suburban services. However, Debroy argues that one should reduce the number of the nation’s trains to make them more efficient. Since this is the lifeline for millions of Indians, how are they expected to travel long distances, especially to migrate to and from employment far away from their homes? This approach is characteristic of neo-liberal policies which have led, for instance, to Mumbai’s once-fabled BEST bus service cutting the number of buses and routes on the ground that they are losing revenue, not to mention selling off depots to real estate developers. Behind all the economic and technical arguments against the Bullet, there is the political dimension. It is hardly any secret that for Modi, this is the “Ballot Train” for the Gujarat elections next year. Why ordinary people are swayed by such grandiloquent schemes, like demonetisation, which only harm common people and divert scarce resources from affordable and reliable public transport by long-distance and short-distance trains, perhaps only a psephologist can tell us. There is also the geopolitical dimension, to which India is unwittingly falling victim. Japan is desperate to counter China’s moves to domineer the high-speed train industry of the world, which is why it is offering India, a huge emerging country, this sweet deal in the hope of bagging future contracts. It is providing a $4.5 billion soft loan on very similar terms for the DMIC to fund two mass rapid transit systems – in Gujarat and Haryana. With Rs 2.75 lakh crores in overseas development assistance since 1958, it has become India’s biggest bilateral donor. It is proposing an Asia-Africa Growth Corridor as a counter to China’s “Eurasian” Belt & Road Initiative, which connects European countries to China. Two years ago, China outbid Japan in securing a high-speed project in Indonesia. It has bagged the line between Bangkok and southern China and is reported to be interested in a proposed line between Delhi and Chennai. Is it in India’s interests to be seen as rebuffing China, all the more so when its technology comes at a cheaper rate, and throwing in its lot with Japan, which is a declining economic power? This week, the New York Times reported how Kobe Steel has falsified data about its aluminium and copper “setting off a scandal that is reverberating through the global supply chain and casting a new shadow over the country’s reputation for precision manufacturing… Kawasaki Heavy Industries, which makes equipment for Shinkansen high-speed trains in Japan, said it was investigating. One should never forget that China has surged ahead to become the world leader in renewables. A decade ago, it had just 100 megawatts of solar photovoltaic (PV) capacity installed. By the end of 2016, China had increased its solar PV capacity by nearly 800 times, with more than 77 gigawatts currently installed. With the US solar industry hamstrung by the US President, it is China which is dominating this sector, including the use of electric vehicles. It would make more political, technical and financial sense to cooperate with China, rather than take it head-on in such a ham-handed manner. 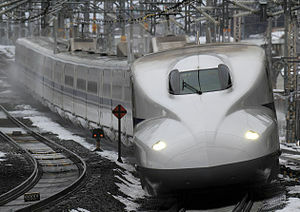 Correction: The value of the Bullet Train project was quoted as $90-billion, the correct value is $17-billion. We regret the error.